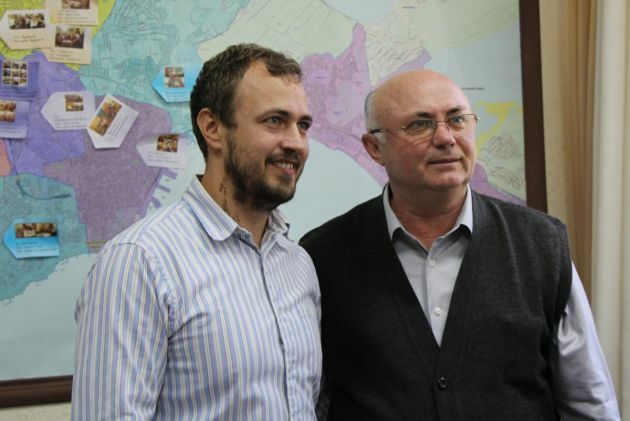 (Photo: Ecumenical News / Peter Kenny)Pastor Petr Serdichenko and his son pose before a map pinpointing the the Good Samaritan Charity Foundation's projects in the Ukrainian city of Odessa on September 29, 2014. Petr Serdichenko is a Pentecostal pastor in Odessa, Ukraine whose work has been especially busy during 2014. More than 200 people a day seek refuge in the area around the Black Sea port of Odessa far from the conflict-torn east of the country. Serdichenko's church is one of the groups caring for the displaced. In eastern Ukraine Russian-backed separatists are waging war and the country is bracing for a long, cold winter with possibilities of gas heating shortages. The conflict has left more than 300,000 people without homes, says the United Nations. Many of the tens of thousands who have come to Odessa, however, fled nearby Crimea after Russia annexed it in March. "Two hundred fleeing people continue to arrive daily from Donbass [the separatist region comprising Lugansk and Donetsk]," said Serdichenko, who heads an aid organization that has helped the displaced in Odessa since April. The People's Church from where much of his work is done is a Pentecostal mission dealing with a multiplicity of social problems. It works closely in running social projects with local authorities helping working families with a schooling program, working in prisons along with elderly people and the disabled. "We are a Pentecostal church. We do not take any government money. Most of what we have is charity from local people. We don′t get money only, but also food, clothes and medicines." The recent cause for his headaches has been people driven from their homes by conflict in the east of the country which was heightened with a vote Sunday by separatists recognized only by Russia. 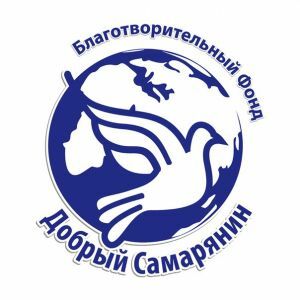 As well as being a pastor Serdichenko is president of the Good Samaritan Charity Foundation based in Odessa. Ukraine's largest harbour Odessa is an industrial region inhabited mainly by ethnic Russians and Russian speakers and where Pentecostals are dwarfed by the Orthodox Church tradition. "The flow of refugees does not stop and we think that these people will stay during the winter because the infrastructure in Donetsk and Lugansk has been destroyed, and schools are closed, as well as hospitals and shops," Serdichenko said. The city of Odessa is a melting pot of more than 130 different nationalities and ethnic groups. This year it celebrated its 220th anniversary since its first mayor French-born Duke de Richelieu was in office after serving in the Russian imperial army. "Our foundation started at the breakup of the USSR [in 1991]. 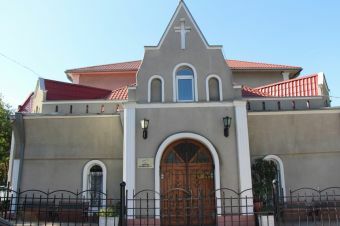 It is the oldest foundation in Odessa," said the pastor, whose group works with all denominations and faiths. Russia has tried to paint the conflict in the east as anti-Russian, but the Odessa population, whilst mostly Russian, wants to be part of the Ukraine and in the European sphere. A group of handicapped people from the east of Ukraine who had sought refuge were housed in a hospital. They were asked why they had come to Odessa rather than to Russia. "Because Ukraine is our country," said one man in a wheelchair who was backed by others in the group, but who did not want their names used. (Photo: Ecumenical News / Peter Kenny)The People's Church which is run by Pentecostals in the Ukrainian city of Odessa on September 29, 2014. How do the inhabitants of Odessa react to the influx of people from the east, many of who want to be part of Russia and not Ukraine? "I can't say there is one feeling about the influx of migrants," says Pastor Serdichenko. He observes that there is a difference in the temperaments of people from the east who tend to be more dour than the more vivacious Odessa people. "We face some problems and sometimes they blame us for the war, but Odessa people say you are the ones who wanted Putin to come." Serdichenko says, however, his is a church organization and does not take sides. "Some people have joined our church and some of them say thank God we are in Odessa." But the pastor says all those who join the church do so out of their own choice and there is no proselytizing that goes on. Businesswoman Ilona Zgurova, who works in the jewellery trade notes, however, that Odessa people "have to pay to keep the displaced, rather than invest in their own development." (Photo: Ecumenical News / Peter Kenny)Ilona Zgurova, the president of the European Association of Businesswomen of Odessa on September 29, 2014. "The people of Donetsk and Lugansk favored Russia because they wanted to get money from Russia, which promised them retirement pensions three times higher than those in Ukraine. Now they must pay for the option they chose." 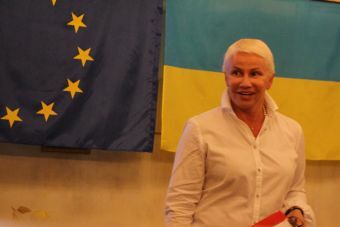 Zgurova is the president of the European Association of Businesswomen of Odessa, and her group is active in helping soldiers wounded on the war front and those that need warm clothing. The Ukrainian budget is in such dire straits that much of the clothing and equipment that troops at the front get comes from private donations, due to the squandering of assets by those ruling in the past. The focus of those proving the aid is to get through the encroaching winter. As they await a return to normality, aid groups are preparing to adapt temporary shelters for the winter and warm clothes for front-line soldiers. 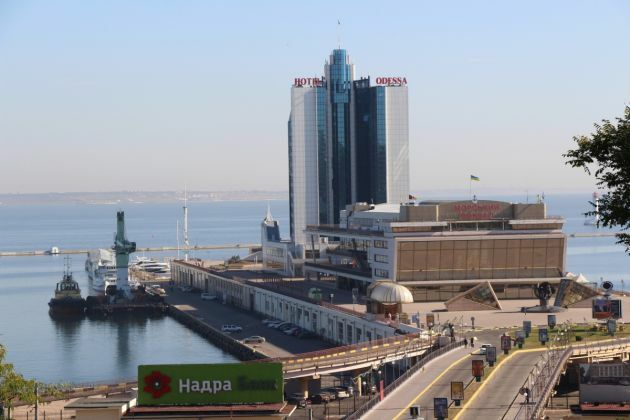 (Photo: Ecumenical News / Peter Kenny)The Ukrainian Black Sea port of Odessa's habor on September 30, 2014.